The final US destroyer design of World War II—the last wartime refinement of the Fletcher concept—was the Gearing class. As with the Fletchers, the Allen M. Sumner class was satisfactory in most respects, but not all. In the case of the Sumners, the shortcoming was in endurance and the solution was simple: lengthen the hull by 14 feet to increase fuel bunkerage. Internal subdivision was improved, but no other changes were undertaken. Hull for Castle, never completed. Keels for Castle (DD 720) and Woodrow R. Thompson (DD 721) were laid down 11 July and 1 August 1945 at Federal Shipbuilding & Drydock Co., Port Newark, New Jersey, Thompson was launched 16 March 1946; Castle was never officially launched. Incomplete, both were canceled and sold for breaking up 29 August 1955. Keels for Lansdale (DD 766) and Seymour D. Owens (DD 767) were laid down at Bethlehem Steel, San Francisco, April 2 and 3 1944. 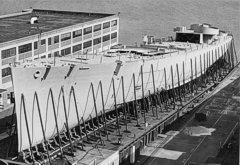 Launched 20 December 1946 and 24 February 1947 respectively after further construction was canceled, their incomplete hulks were berthed at Suisun Bay, California. In 1956, the two were towed to Long Beach, where their hulls were used to repair Floyd B. Parks and Ernest G. Small. In 1959, their remains were sold for scrapping. Keels for Hoel (DD 768) and Abner Read (DD 769) were laid down 21 April 1944, also at Bethlehem, San Francisco. Never launched, they were canceled 13 September 1946 and broken up in place. A keel for Seaman ((DD 791) was laid down at Todd 10 July 1945. She was canceled 7 January 1946; her hulk was launched 7 May, but not sold for scrapping until 12 September 1961. Of 152 “long-hull Sumners” ordered, 98 were completed (see list at the bottom of this page). Two (Bath Iron Works’ Frank Knox and Southerland, numbered in sequence and launched without pause in the production schedule after Drexler, the yard’s last Sumner) commissioned in 1944. Forty-five commissioned before the end of the war, 62 by the end of 1945 and 91 through 1946, followed by two more (Lloyd Thomas and Keppler) in 1947, four more (Epperson, Basilone, Carpenter and Robert A. Owens, with anti-submarine warfare modifications) in 1949, and a final one, (Timmerman, with an experimental engineering plant) in 1952. Seven (see box at left) were canceled. Keels for the remaining 47 (DD 809–816, 854–856 and 891–926) were never laid down. In 1945, in anticipation of the invasion of Japan, the Navy began converting 24 Gearings as radar picket ships (designated DDR in 1949) that could provide early warning of massed attack without overwhelming their Combat Information Centers. Twelve of the first thirteen ships to complete (DDs 742–3, 805–8, 829 and 873–77) were selected in January; twelve more (DDs 830–35 and 878–83) in May. Conversions were carried out at Boston and Norfolk Navy Yards and involved replacing the forward torpedo tube mount with a tripod mast for height-finding radar and other systems. The result was so effective that a further eleven were converted in 1952–3. Thanks in part to the 1–2-month post-commissioning delay in converting these early Gearings, they did not begin arriving in the war zone until late June, joining fast carrier task forces only in time for screening and plane-guard duty during the final air raids of the war. None were damaged or lost; three, Frank Knox, Southerland and Perkins, entered Tokyo Bay in time to be present at the Japanese surrender, 2 September. As the US Navy’s newest destroyers, none were mothballed after the war. Beginning in the late 1950s, 44 received FRAM (Fleet Rehabilitation and Maintenance) Mk I conversions while two were modified for testing: Gyatt as a guided missile platform and Witek with a “pump-jet” propulsion system. Together, the Gearings with surviving Sumners and some Fletchers continued in US Navy service during the cold war alongside the Forrest Sherman and Charles F. Adams classes until retired when larger Spruance-class ships began commissioning in the 1970s. Thereafter, some were sold to the navies of Argentina, Brazil, Greece, Ecuador, Iran, Mexico, Pakistan, South Korea, Spain, Taiwan, Turkey and Uruguay, served through the 1990s. The remainder were sunk as targets or scrapped. Today, two are preserved: Joseph P. Kennedy, Jr. at Battleship Cove, Fall River, Massachusetts, and Orleck at Lake Charles, Louisiana. Gray text indicates ship commissioned after World War II. 850 Joseph P. Kennedy, Jr.